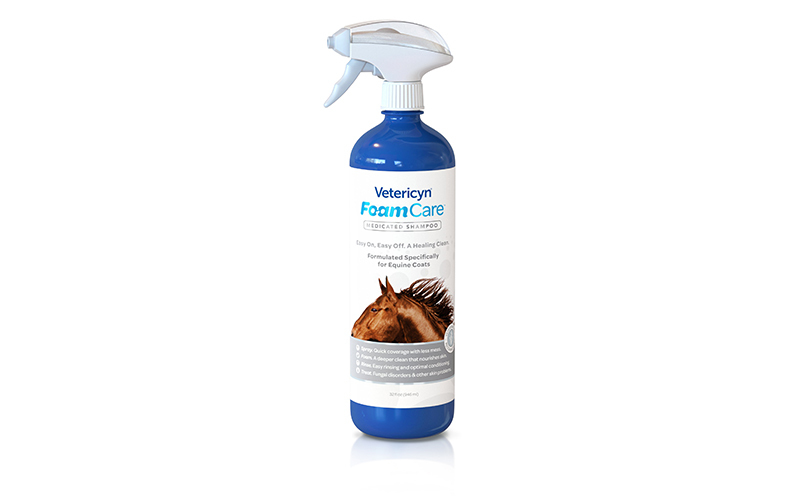 Vetericyn FoamCare™ Medicated Equine Shampoo is specially formulated to alleviate and manage skin ailments. This medicated shampoo aids in relieving itchy, dry, scaling and irritated skin as well as treating psoriasis and seborrheic dermatitis. With its innovative foaming spray applicator, FoamCare™ Medicated Equine Shampoo is applied evenly with less mess—simply from the squeeze of a trigger. FoamCare™ Medicated Equine Shampoo supports optimal skin & coat health and is non-irritating, pH optimized, and retains the essential oils in your pet’s skin. It’s the new easy on, easy off shampoo that makes bathing pets more fun with less stress! Listen to Clinton explain why he uses FoamCare™ Equine Shampoo on his horses in this video.